Height of cup - 65mm. Oven, microwave, dishwasher and freezer safe. Made of great value white porcelain with chip-resistant rolled edges. Great value white porcelain, rolled edges - chip resistant. Designed and made with the serious coffee connoisseur in mind. All our Nicola Spring crockery is porcelain and is hand painted in a range of authentic and beautiful colours - make sure you check out all our patterns! Dishwasher and microwave safe. Width: 125mm. Made of great value white porcelain with chip-resistant rolled edges. Great value white porcelain, rolled edges - chip resistant. Designed and made with the serious coffee connoisseur in mind. Vitrified for heat resistance and rolled edges that minimize chipping. Perfect for mix and matching. Dishwasher and microwave safe. The colours brighten up all interiors whilst the charming shabby chic patterns will have you reaching for your Nicola Spring crockery sets at any given opportunity. Capacity 90ml. Espresso Cup & Saucer Sets. Perfect for espresso coffee. Made from porcelain. Cup size (Length x Width x Height): L-8cm x W-6.2cm x H-5cm. We do however try our best to shorten the process. Every detail matters when you're setting the table! 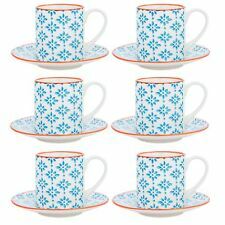 Nicola Spring Patterned Espresso cup and Saucer set. Nicola Spring Patterned Espresso cup and Saucer set. 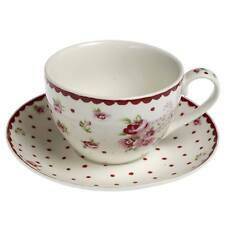 A truly elegant shabby chic porcelain Espresso cup and saucer. The colours brighten up all interiors whilst the charming shabby chic patterns will have you reaching for your Nicola Spring crockery sets at any given opportunity. Perfect for mix and matching. 100% dishwasher and microwave safe. Alice in Wonderland Espresso Cup & Saucer. This espresso cup and saucer set is a curious piece! The quote ‘Oh dear! I shall be too late!’. twirls around the dainty cup while the saucer reads ‘We’re All Mad Here’. LSA international coffee cup and saucers 4 set Celeste platinum coffee cups & saucers white & silver ex condition. Condition is Used Dispatched with Royal Mail 2nd Class. DECORATED WITH LOVELY RED ROSES WITH PRETTY DECORATIVE FEATURES ON BOTH CUP AND SAUCER. Condition is New. I nc lu de s a te ap ot with lid and 2 individual mu gs. 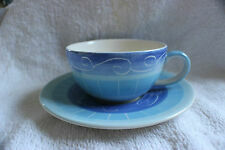 New listingMatching Teacup, Coffee Cup and Saucer. Make Unknown. 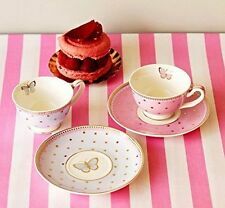 Matching Teacup, Coffee Cup and Saucer. Make Unknown. All pieces have same number: 5/1925. Condition is Used. Dispatched with Royal Mail 2nd Class. Capacity: 260ml. All our Nicola Spring crockery is porcelain and is hand printed in a range of authentic and beautiful colours - make sure you check out all our patterns! 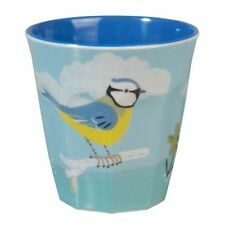 Can be heated in the microwave and are dishwasher safe. PINK REGENCY STYLE TEACUP AND SAUCER. Simply over-flowing with subtle Regency-style charm, this delightful soft pink regency style teacup and saucer is perfect for afternoon tea. You can complete the look with a matching cake stand. Gilding is also in very good condition with little or no rubbing. ENGLISH GARDEN. It was made in Staffordshire England and the pattern is English Garden. 6 x Tea Plates – 16cm across. 1 x Jug – 9cm high x 12.5cm across from spout to handle x 8cm across the lip x 5.3cm across the base. Buckingham Japanese Style Four Piece Cast Iron Tea Cup and Saucer Set, Green Dragonfly. Note Japanese drink tea at warm temperature. Our stylish cast iron cup & saucer makes a great gift for any loose tea lovers, from green tea to herbal tea. Apilco olive green gold 2 x large coffee cups. Beautiful examples in an unused condition. There is a tiny casting off mark on the gold trim, this is shown in the last photo. This is hardly noticeable unless you look for it and certainly does not detract in any way. A super pair of oversized French bistro cups that stack perfectly. I have more from this range listed. Please contact me for reduced shipping costs when buying multiple items from my shop. I am more than happy to combine postage. 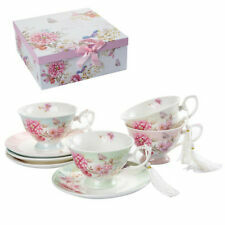 BLOOMING BEAUTIFUL TEACUP AND SAUCER SET. This is a set of one teacup and one saucer - in white with a pink print featuring pink and mauve flowers. BLOOMING BEAUTIFUL. Date: 2018. Pair Of Weidmann Porzellan Demitasse Espresso Cups And Saucers. Condition is Used. Dispatched with Royal Mail 2nd Class. Pices Quoted Are For UK Mainland Only & Excludes Scottish Isles / Highlands, Ireland And The Channel Isles. Set Of 6 Quality. It's Condition Will Be Clearly Listed At The Top Of The Page. To Full Cases Of 72. Apilco olive green gold 3 x cups/saucers 1 x milk/cream jug. Cups are 8 cm x 5.5 cm. All pieces are superb, all of the gold is unworn and there is not as much as a spoon mark inside the cups. Fantastic French bistro ware that stacks beautifully in unused condition. I have more from this range listed. Please contact me for reduced shipping costs when buying multiple items from my shop. I am more than happy to combine postage. 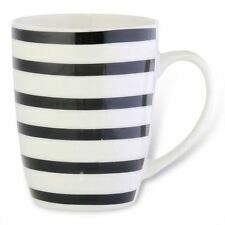 The cup it self has classic round structure which curves out and up. 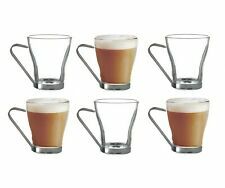 Glass being one of the most common strong materials, you shall assure this coffee cup set will perfect for any drink being served. Retro Style Spotted Espresso Cups From Katie Alice, New & Still Boxed! These Vintage Cups By Katie Alice Are Perfect For A Nice Little Shot With Friends, Accompanied With a Beautiful Stylish Box It's Safe To Say That These Are A Major Hit In The Coffee Community. Another Wonderful Product From A Wonderful Creator. Dishwasher and Microwave Safe! Each piece has a pretty pink and blue floral decorative pattern that's vibrant and beautiful against its crisp white ceramic background. This will be a varied Batch examples similar to photographed but may not be the exact ones. There will be a mixture of materials between, Bone China, Ironstone and Pyrex. All of varying ages and designs, you will receive a mixture of colours.